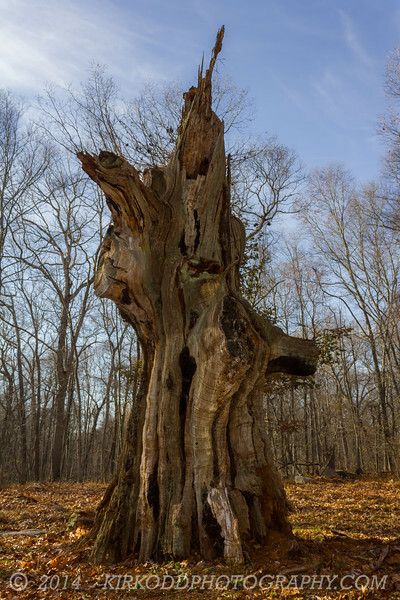 This mournful stump is all that is left of the once mighty Ledyard Oak. This was a huge tree of many names. In its 400+ years on this earth, it has been known as the Great Oak, the Lester Oak, the Larabee Oak, the Graves Oak, and finally as the Ledyard Oak. Located at the Nathan Lester Farm Tool Museum in Ledyard, CT, this stump is all that remains of the historic great white oak tree. According to the sign on the property, the tree was 21 feet in circumference and 70 feet tall, with a crown that spanned 105 feet. The massive size of this dead giant is still evident from the circular clearing surrounding the tree. A baby oak tree was planted next to the stump in tribute to this ancient tree. The land surrounding the Ledyard Oak was Pequot Indian territory. Legend has it that many important Indian councils were held in the shade of this great tree. The tree was officially declared dead in June of 1969.